I mixed it in the morning. I wanted it to have all day to chill and for those immense flavors to marinate in what was going to become my evening taste bud explosion. I once again had visions of Orange Julius as I stirred and stirred and stirred the powder into submission. I couldn't WAIT for 9pm to roll around so I could drink my first 16 ounces and start glowing in the dark. Yeah, first 16 ounces because I was going to drink another 16 for breakfast! I made it about 2 ounces in and was trying not to gag with every sip. I even took it the the next level and turned it in to an imaginary Sunrise Ice Blended from Coffee Bean and Tea Leaf. That's deep people! I was willing to ruin the thought of a perfectly good Ice Blended for the sake of getting this stuff down. I know I promised I'd throw a tantrum if they ever tried to get me to drink anything with "barium" in its title, and yet here I stood with an ice cold cup of E-Z-CAT Dry. Clearly I'm all about second chances and was willing to give the powdered version the benefit of the doubt. I was given these packets at the oncologist's office and made a tiny stink. Apparently it was large enough of a stink that the nurse actually called over to the radiology department at the hospital to see if she was indeed giving me the nasty version of barium. Like there's a tasty version of barium sulfate somewhere in the world that's yet to be discovered? I doubted a bag of powder could really turn into something as thick as the real sludge, but I wanted to make sure. 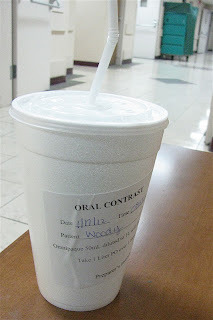 Radiology said they hadn't gotten any complaints, and another nurse actually pulled out a jug of the milkshake variety and said that was what was required by the other hospital. Note to self, never get a CT scan through the other hospital system. I accepted the reviews and took the packets home. Knowing they had the flavorless liter of water available, I told myself I'd trying and get this powdered stuff down and pull my "I'm gagging and I just can't stop, so can I come in and drink the liter of water?" routine if I had to. I'd rather spend my hour waiting at home, but would gladly roam around the hospital if it saved my taste buds. Serious side effects of barium sulfate may include severe stomach pain, sweating, ringing in your ears, pale skin, weakness, or severe cramping, diarrhea, or constipation. Great. That sounds like the morning after a bad night out at a club. With my epic fail in the drinking department, I went to bed with high hopes that I could call in the morning, gag over the phone and they'd let me come in and drink my liter of Omnipaque. It wasn't even that complicated. I didn't need to make excuses. I mean, does one really need an excuse when it comes to avoiding the barium milkshake? So I drank my liter of water, read my paperback thriller and waited the hour. I tried not to think about why I was there and what the potential results could be. It wasn't until I was laying on the table and the machine started to spin that I began to acknowledge the obvious. I closed my eyes and tried to meditate on scripture. I envisioned and knew that I wasn't alone in that moment or in that room. I also knew that my body was either going to amaze me or betray me again. I'll walk in to my appointment on Friday and know that regardless of the results, God will be faithful to us in this journey. Even if we don't get the good news we want, we still know that God has long known our path and will continue to walk with us on it. that stuff is beyond horrid. I had a ct-scan every year for 15 years. The version you have now is the newer, thinner one--the old one was waay worse, if you can believe it! This stuff is like water, literally. But not everyone uses it. They gave me the nasty stuff at my PET scan and I told her she would be lucky if I got an inch of it down. I held my nose, took a swig, took another swig of water and down it went. And I didn't even get half the cup down before it was time for my scan. Demand Omnipaque! Taking the proper medication is the only way that you are able to get relief from that problem. Precaution is the one thing which you are supposed to be having on the priority. © Colon Cancer Chick 2011-2014. Awesome Inc. theme. Powered by Blogger.